This Sunday the 4th September 2016 saw the 37 mile Mountain Time Trial, the final event in this years season. The course running out and up from above Denbigh towards Bwlchau and then up onto Denbigh Moors before a left alongside Llyn Brenig, and then down the others side to Cerrigydridion, and back to Ruthin. The final stretch heading back towards Denbigh, into the business park – and a cruel uphill finish. 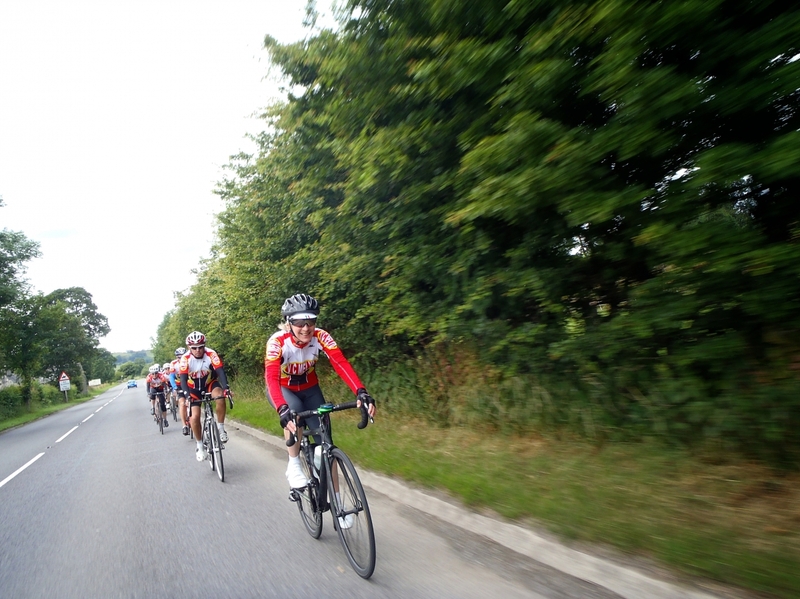 The weather was gusty and overcast after overnight heavy rain – traditionally an end of season celebrated event – this year saw a hardy ten riders turn up to undergo the discomfort of 37 miles of pain with the added bonus of up and down thrown in. This completes the Velo Club Melyd & Rhyl Cycling Club season for 2016 with official finish times to follow / confirmation of end of season points. The next event is the Brass Monkey 9mile TT on Sunday 1st January 2017 – best get that in the diary then! 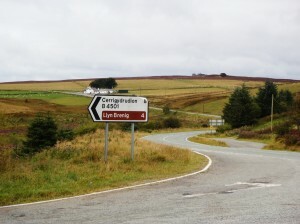 Sunday 7th August brings the fourth round of the North Wales Road Race (NWRR) series – Llyn Brenig. We look forwards to seeing you there – it should be a great day out. The Riders and Officials Race Day Pace for NWRR RD4 has been published on the NWRR Facebook Group. The event guide can also be found here. The route was published on Strava at the end of last month. The route for the NWRR4 runs anti-clockwise, and can be found here. Please do not park in the Anglers Carpark at Llyn Brenig Visitors Centre. There is a fishing competition on and the car park is clearly signed. There are three other available car parking areas at the visitors centre that are available to use. 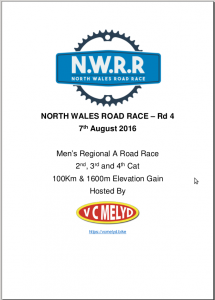 VC Melyd are hosting the North Wales Road Race Series in 2016. It’s an exciting new year with 3 new circuits and the series now includes 5 rounds. The series remains as a men’s 2/3/4 race with a maximum of 80 participants. We have proposed to hold a women’s E/1/2/3 race at Rounds 1 and 4 but are awaiting confirmation from Welsh Cycling. Events now live on British Cycling Events Calendar. This 2 day stage race will include a Criterium Race, Hill Climb TT and a Road Race. Saturday Morning – Criterium Race, Marsh Tracks, Rhyl. 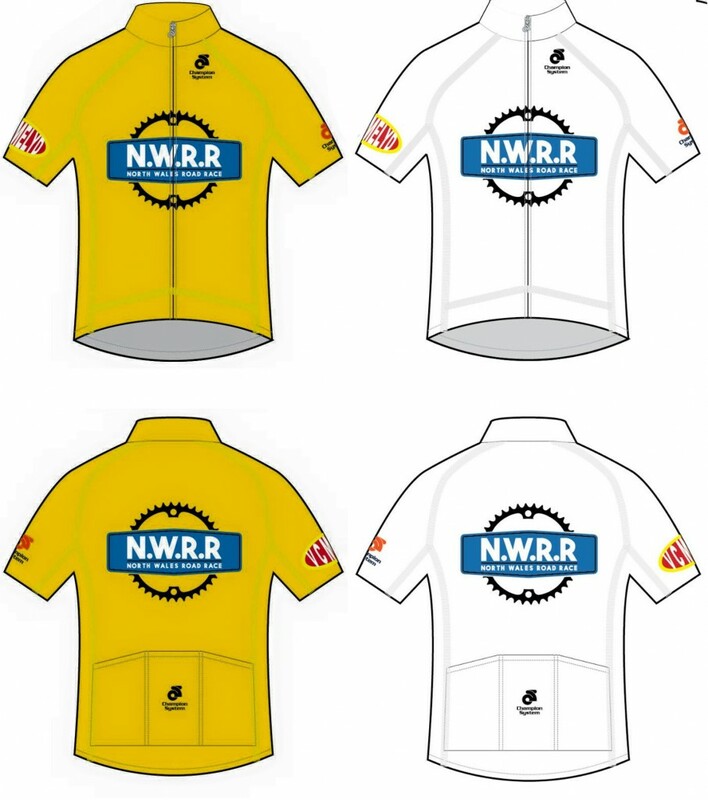 Big thanks the Darran Acton at ‘Champion Systems UK’ for supplying the series leader jerseys for the NWRR series. After each round the series leader will be issued a jersey to wear at the next round. The first jerseys will be handed out at round 2 for over 23/under 23. Thank you to Donna for this weekend’s route. 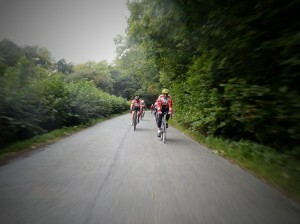 55 miles, and 4,800ft of climbing – available on Strava for download. 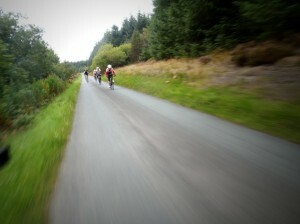 Out to Llyn Brenig via a back route to Henllan, then up to Bylchau and Brenig for a café stop. Rather than the usual route back via Cerig y Driddion – an early turn left, and back via The Steps to Ruthin. It is the weekend of the Wild Wales Challenge – so we will be down in numbers. For those who have been offering their Wild Wales entries online – we will be posting an alternative adventure for you for Sunday. The route can be found over on Strava. The route covers 66 miles and 6000ft of climbing. There is no route leader this weekend. Saints then out to Rhuddlan. 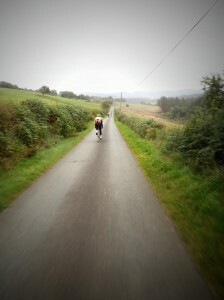 YGC then Engine Hill then over to Llanfair TH, before the slow climb to to Llanrwst. A short A5 run before the seemingly endless tree covered climb to Nebo and down to Cerrigydriddion – then up past Llyn Brenig, then back via Denbigh then St Asaph over the A55 to Dyserth and home. Thank you to the organisers, and everyone who travelled to the area to take part in the event… whether you did the Long, Medium, or Short route – what an achievement. See you next year. Thank you Sally for this route of 83 miles and 6,607ft (plotted on Strava) of climbing for those not taking part in the Peak District Away Day. Dyserth and Waen to Denbigh (skipping Rhuddlan). 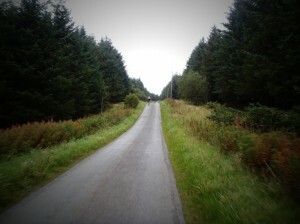 Out of Denbigh via the Road To Hell, and on to Llyn Brenig. Left at the Brenig, to Cerrig, and then the faster road into Bala. 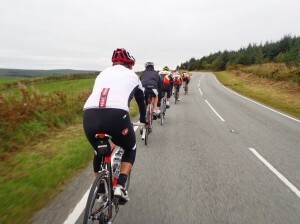 UPDATED: The route as ridden headed back from Bala towards Corwen, meeting the Horseshoe Pass before the ascent proper, and then down through the Nant Y Garth after a cup of tea nd regroup before heading along the Waen home. 2x top 100 climbs in a day. This route put together by Darren this week. Heading out towards the West with no pick up in Rhuddlan – heading around the East side of the Clwydians, before dropping down to Ruthin, off at Llanraeder, then up there towards the Road To Hell (UK100 climbs), towards the moors, another stop at the Llyn Brenig if required and back down into Henllan, St Asaph, and back to Prestatyn. 63 Miles, 5700ft. It includes the Road to Hell. We can create a cut through if people want to miss it out as an option. Cafe stop in the Craft Centre then if we want a brew at Llyn Brenig we can.